Description: This video made by ColorBox is for Magic Mosiacs. A must have for any craft room, this video comes in a hard back case and runs 55 minutes in stereo. Learn how to use stylus tips, Vivid inks and much more from Jennifer Obertin. Description: This is a wonderful full color 2 sided Tip and Technique sheet for Colorbox Crafters inks. Back side has full instructions for Shrink Plastic Jewelry. Size: 5 3/4" x 8 1/2"
Description: This is a wonderful full color 2 sided Tip and Technique sheet for Colorbox Pigment Ink Pads. Learn about the exclusive features of this product as well as what Acid Free is. There is also techniques for Scrapbooking Enthusiasts. Description: This is a wonderful full color 2 sided Tip and Technique sheet for The Rollergraph Roller Stamp System. Get basic techniques for embossing and rolling. Lear how to make stationery and decorated boxes using these items. Description: This is a VHS Video made by the Clearsnap company. It is full of tips and techniques for doing the nice Direct to Paper technique. 35 minutes longs and great for basic techniques for advanced looks. Size: Case is 4 3/4" x 8"
Description: This is a VHS Video made by the Clearsnap company. 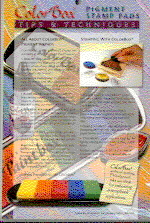 It is full of tips and techniques for use with Permanent Inks. Video is 30 minutes long and full of many different ideas. Description: This is a 30 minute VHS Video called Focus On Frames by Clearsnap, Shows techniques for the colorbox ink pads to make frames and tiles to use with photos, mirrors and portraits. Description: This video made by Posh Impressions is called Magical Rainbow Sponge. Comes in a cardboard cover and is great for getting new ideas for you to use. Run time on this is approx. 35 minutes and the demonstrations are done by Dee Gruenig. Description: This is a book of techniques, examples and instructions for the Magical Rainbow Sponge technique. You can use this book with the inks, sponges and videos sold here. Description: This video made by Color Box is called Special Techniques for Crafter's and PolyShrink. Comes in a hard plastic case and is great for getting new ideas for you to use. Run time on this is approx. 32 minutes and the demonstrations are done by Kit Zimmerman of Lucky Squirrel. Description: This is a set of 2 VHS Videos called: The Colors of Provence. Made by Clearsnap, the makers of Colorbox inks and such.Volume 1 is Inspired Projects andVolume 2 is Touring Provence. Each is approx. 30 minutes long and each comes in a hard plastic video box for storing. Description: This is a video made by Clearsnap which will give you Unique Techniques for the Color Box line of products. Video comes in a hard plastic storage box fr safe keeping and it runs 56 minutes long. You can learn new techniques such as Paper Batiking, Marbled Glass, Paper Weaving and much much more!! Description: This is a nice booklet for the Pearl Ex fan. Has Tips, Techniques and projects for you to copy and learn from. Soft covered.